Georgi and Gergana have made many marionettes for me, and each one is a work of art. Georgi is a master wood carver, with amazing skills and a unique imagination. G&G are also a pleasure to work with and go out of their way for their customers. I can't recommend them and their work highly enough. The Puppets arrived yesterday evening . Just as walked through the door the parcel man came. just in time. We opened together .We are speechless . The quality is far better than i could imagine . They are beautiful and traditional.They are just so amazing. I do not know how you both do such wonderful work.We are so proud and happy about them. , incredible. I love the mechanics on everything . Words can not describe the feeling we have about them.They will be so popular here around us.We are so happy that you got a lot of work coming in . Because you both have gods gift for creation .A work of a miracle xxxxxxxxxxxxxxxxxxxxxxxxxxxxxxxxxxxx lost for true words. thank you. The Tudors are a company of puppeteers in Cambridgeshire,England. Our knowledge of marionettes spans some 50 years. In 2015 we invited Georgi Georgiev to be involved with the company and become our Master of marionettes. We are proud that the very well talented wood sculptor became a part of the company. I know at marionettesBG they do many styles to meet to needs of their customers the time that is taken to work with the customer is outstanding. Communication is fast and the need to may the customer happy is felt. 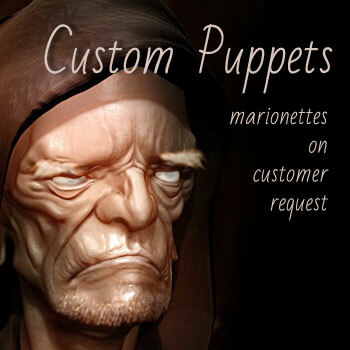 I highly recommend to anyone that is wanting parts made or a full marionette to make contact. We are well satisfied and the price for this work in comparison with some other web sites is a fare price and a very good value. Georgi and Gergana are true craftsmen who take great care and pride in their work. Their puppets not only look good but work beautifully as well. Georgi has carved three amazing puppets for me so full of character – two from designs I supplied - and his attention to detail is superb. So, if you want something truly unique to treasure for years to come, then these two artists are definitely the people to talk to. I wish to recommend these two great artists, who with their hands and especially with his great love for what they do, have achieved what I dreamed as a child: to have my own dummyl ventriloquism. I found Georgi and Gergana on Facebook, and I was lucky to get in touch with them because they have given me follow the development of my idea of the dummy from the start of work. Sending photos and asked if I had any questions to do ... I had to wait a month, but the result has been exceptional as you can see. I was very happy with the result. You can trust this couple artists (Georgi and Gergana), his works have a special, fantasy and magic charm. Thanks so much for wood ventriloquist head !!!!!! I plan to hire you for more work! You are an AMAZING wood carver!!! I finally made it home and got to take a look at the wonderful work that Georgi did carving head and hands ventriloquist Colonel Sanders for me.What talent this man has, no wood putty, just carvered to perfection. I am going to add the mechanical features (mouth and eyes) but Georgi skills as a wood carver is world class.I am 100 percent pleased.The head is human size . Just today received your head and hands wood carved for me ventriloquist Marshal figure style they are excellent! Thank you both. When i received my package from Marionettes BG i was impressed by the way my marionette was protected from damage. I get a lot of packages and only a few kept the contents as safe from damage as this one. I saw several photographs of this skeleton marionette before i received it, but i became more impressed as i unwrapped it. This is high quality, professional work. I have seen marionettes through out my life on television, but only a few times in person. Never very close. This marionette has many points of articulation, more than i expected. Overall, i am very happy with my purchase and the help i received while ordering. I had my marionette customized to exactly the way i wanted it and i appreciate that effort. I can't wait to bring it to life. Thank you for your fine merchandise and excellent service. I am anticipating my next order. Just recieved my order Devil Woman from Georgi and Gergana. A beautiful work of art from the hands of a master of his art. The care taken and attention to detail is among none other. She is now a part of the family and will be handed down through the generations. Pictures cannot do justice on how beautiful this marionette is. Was packaged securely and shipped swiftly to the United States. Georgi and Gergana have been swift with answering questions and very friendly. I hope to buy more from Marionettesbg in the futureore, USA. Thank you Georgi and Gergana! I recently received a beautiful carved ventriloquist dummy head from Georgi Georgiev and I couldn't be happier. His artwork and attention to detail are wonderful. He carved out a figure for me from an old photograph. The communication and turnaround time were great as well. I'll post pictures of him once he's finished. I highly recommend him if you want a figure carved. Thanks again Georgi. I would like to thank Georgi Georgiev for the beautiful pair of ventriloquist figures that he sculpted for me, and for the wonderful restoration work that he did for me on my Lovik figure. Georgi is a master sculptor, and it is a joy to own these works of art that he has created. it is also a privilege to have had the opportunity to get to know him and his family, as they are some of the nicest people I have ever met. i highly recommend him for any custom wood carved projects you might have in mind. Hi Georgi and Gergana.Today the ventriloquist wood carved hands arrived! Great. Perfect. Now to paint and attach to the puppet here. Great work, thanks! Hi guys. Well Boris ventriloquist dummy completed his journey from chilly Bulgaria to rainy Sheffield... and he's great! I think you've captured him perfectly. Like our Foreign secretary, he's a true dummy.The only difference is he's a lot cuter than the real thing.You've done a really wonderful job.Thanks again. Thanks so much I already received your puppet carved ballet dancer... it arrived today. I can't wait to get it to my studio and paint dress and pit the joints all together. thanks again!!!!! Thank you so much Georgi, that make for me this amazing carved full ventriloquist dummy, it's exactly all how i want. He look spectacular, I am so happy thanks again. Will want again make for me soon another dummies. Hello,Very lovely. And all marionettes is great what make for me, for my dancing charcter! Yes, we have had more high fevers around here. It doesn't stop.But spring is coming and we are planting our seedlings under the grow lights. I performed with the puppets yesterday and everyone loved them. I have another big show on Friday. I've also taken the jester in supply teaching with me, and it walks classes down the hall and even gets chased in gym class! Both marionettes what buy from you Ballet Dancer and Pirate are amazing and so beautiful i received today. Thank you so much. That's amazing! You guys did a really good job with my wood carved ventriloquist head and hands.Thank you! I opened the box and the fairy marionette is JUST FINE! I love her! She is exquisitely beautiful and I will treasure her for the rest of my life. Thank you so much for working with me, and keep in touch. I have new friends now in Bulgaria!! Thank you kind people. I really like your work. I wish you great success. You make the world a better place with your beautiful puppetry, marionette, and ventriloquist dummy sculpting. Yes we finally received the package yesterday with Pinocchio Girl marionette and when we took the girl out of the box. Our daughter absolutely loves it and has been so excited and happy about receiving it .Thank you! G & G - I have released the Jester from his box. He is a wonderful, beautiful work of art! Everything about him is great. His expression is perfect. His hands are exactly what I wanted - even with fingernails! His shoes, his clothing, his painting, his construction - all beautifully done. You both are very fine artists. The Jester makes me happy, and will make my wife very happy. Thank you! Thank you very much marionette Don Quixote come. I like so much is great! The all 5 custom marionettes arrived and are beautiful, thank you. Congratulations - ventriloquist dummy he looks fabulous! You have truly captured the wooden legend that is David Beckham. The puppets arrived complete and as expected. They are so beautiful. I can't wait to paint and costume and string them. In the next month or so between my many gigs. I'll send photos. Thanks so much for your work and prompt delivery!!!! Cannes Cannes Dancer marionette is wonderful : she is very classy and popular in the same time, like a drawing of Toulouse-Lautrec, la Goulue, for example. It is really a masterpiece ! Congratulations for this wonderful puppet, you are a great artist. Thank you very much and hope to see you one day. Yes, I received the Devil yesterday and I am so thrilled with him! He's totally amazing and beautifully created. He arrived in perfect condition - not scratch on him, so great job on packing him as well. Thank you so much for this awesome marionette - I am so happy and will be sure to update you with his name and when I have some footage to show from my web series.You have both been amazing from start to finish with this order and I couldn't be happier with the service and marionette.Thanks again for everything. 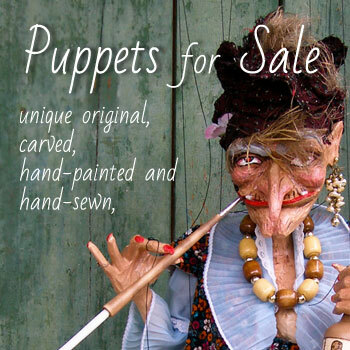 Beautiful custom hand carved puppets masterfully crafted at an affordable price! Georgi is simply the way to go for custom basswood ventriloquist figures. I have bought many marionettes from all over the world but to put it simply, Gergana and Georgi are the best marionette makers in the world today. Well deserved praise. The marionettes are made with perfect balance , perfect movement and are really beautifully constructed and dressed with such acute attention to detail. Gergana is excellent to communicate with and I was well supported during the whole transaction. I have bought three of his marionettes over the years and will likely purchase more. Astonishing quality and the friendliest people to do business with. Great artists and perfect service make this a shop to visit often!! l will be back with custom orders to be sure. Thank you both so much!! Well Marilyn Monroe marionette has arrived safely. I absolutely love her! Wow! Amazing! Beautiful! Very, very, very nice! You are truly a master at your craft. I will bring her to my Ventriloquist convention in July to show her off and get you more business. As for me, I will definitely order more puppets from you. I am trying to decide which puppet for you to make next. Have a great week and thank you so very much for the wonderful job! God bless you and your family! Ventriloquist head arrived... thank you very much ! The work is fantastic! Excellent craftsmanship on this jester marionette! My marionette was carefully packaged and arrived in perfect condition. Great communication from this seller. I think they were as excited as I was for me to receive my marionette. I’m very pleased!